The adopted criteria describe design values for through travel lanes, auxiliary lanes, ramps, and turning roadways. There are also recommended widths for special-purpose lanes such as continuous two-way left-turn lanes. AASHTO also provides guidance for widening lanes through horizontal curves to provide for the off-tracking requirements of large trucks. Lane width does not include shoulders, curbs, and on-street parking areas. Table 3 summarizes the range of lane widths for travel lanes and ramps. It is FHWA policy that the requirement of a formal design exception for lane width is applicable for all travel lanes, including auxiliary lanes and ramps. With respect to the practice of widening lanes through horizontal curves, a formal design exception is not necessary for cases not providing additional lane width, but the decision should be documented in project records. Exhibit 7-3 in the Green Book describes minimum lane widths for two-lane rural highways for a range of design speeds and design-year traffic. The table entries show a 24-foot traveled way (12-foot lanes) for most conditions. Careful inspection of this table (see subnote [a]) shows that 11-foot lanes are acceptable and within policy for reconstruction projects in which an existing 22-foot dimension is operating in a satisfactory manner. For such cases the designer should document this is the case, but retention of the 11-foot width would not require a design exception. Speed is a primary consideration when evaluating potential adverse impacts of lane width on safety. On high-speed, rural two-lane highways, an increased risk of cross-centerline head-on or cross-centerline sideswipe crashes is a concern because drivers may have more difficulty staying within the travel lane. On any high-speed roadway, the primary safety concerns with reductions in lane width are crash types related to lane departure, including run-off-road crashes. The mitigation strategies for lane width presented in Chapter 4 focus on reducing the probability of these crashes. In a reduced-speed urban environment, the effects of reduced lane width are different. On such facilities, the risk of lane-departure crashes is less. The design objective is often how to best distribute limited cross-sectional width to maximize safety for a wide variety of roadway users. Narrower lane widths may be chosen to manage or reduce speed and shorten crossing distances for pedestrians. Lane widths may be adjusted to incorporate other cross-sectional elements, such as medians for access control, bike lanes, on-street parking, transit stops, and landscaping. The adopted ranges for lane width in the urban, low-speed environment normally provide adequate flexibility to achieve a desirable urban cross section without a design exception. Designers should understand the interrelationships among lane width and other design elements. On high-speed roadways with narrow lanes that also have narrow shoulders, the risk of severe lane-departure crashes increases. Drivers on rural two-lane highways may shift even closer to the centerline as they become less comfortable next to a narrow shoulder. At other times, they may shift closer to the shoulder edge and are at greater risk of driving off the paved portion of the roadway (and over potential edge drop-offs) as they meet oncoming traffic. Horizontal alignment is another factor that can influence the safety of lane width reductions. Curvilinear horizontal alignments increase the risk of lane departure crashes in general, and when combined with narrow lane widths, the risk will further increase for most high-speed roadways. In addition, trucks and other large vehicles can affect safety and operations by off-tracking into adjacent lanes or the shoulder. This affects the safety of other drivers, as well as non-motorized users such as bicyclists who may be using the adjacent lane or shoulder. It is important to understand this interaction of design elements when a design exception for lane with is being evaluated. Figure 6 shows accident modification factors for variations in lane width on rural two-lane highways. Note that there is little difference between 11- and 12-foot lanes. Accident Modification Factors for Lane Width on Rural Two-Lane Highways. Figure 6 is a graph. 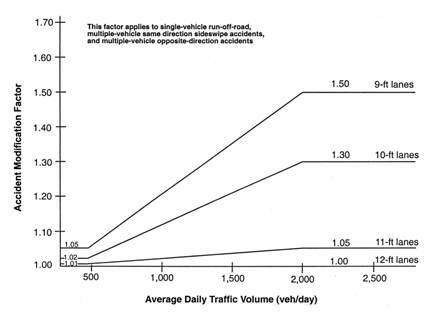 The "x" axis is labeled "Average Daily Traffic Volume (veh/day)," and is marked in increments of 500; 1,000; 1,500; 2,000; and 2,500. The "y" axis is "labeled Accident Modification Factor," and is marked in decimal increments of 1.00, 1.10, etc., through 1.70. A note at the top of the "x" axis states, "This factor applies to single-vehicle run-off-road, multiple-vehicle same direction sideswipe accidents, and multiple-vehicle opposite-direction accidents." The accident modification factors for the various lane widths begin as horizontal lines showing a very minor difference in crash risk. As traffic exceeds 500 vpd, the AMFs increase linearly and at 2000 vpd, the AMFs return to horizontal lines. At this point the AMF for 12-foot lanes is 1.00, for 11-foot lanes is 1.05, for 10-foot lanes is 1.30, and for 9-foot lanes is 1.50, illustrating that the expected crash risk is significantly higher for 9- and 10-foot lanes on rural two-lane highways. For multilane urban arterials and multilane rural arterials, the expected difference in substantive safety for variations in lane width is much lesson the order of a few percentage points when comparing lane widths of 10 to 12 feet. Lane width has an effect on traffic operations and highway capacity, particularly for high-speed roadways. The interaction of lane width with other geometric elements, primarily shoulder width, also affects operations. When determining highway capacity, adjustments are made to reflect the effect of lane width on free-flow speeds. Lane widths of less than 12 feet (3.6 meters) reduce travel speeds on high-speed roadways, as summarized in Tables 4 and 5. Table 6 summarizes the potential adverse impacts to safety and operations for a design exception for lane width. Guide for the Planning, Design, and Operation of Pedestrian Facilities, AASHTO, 2004. A Guide for Reducing Collisions on Horizontal Curves, NCHRP Report 500, Volume 7, Transportation Research Board, 2004. A Guide for Reducing Collisions Involving Pedestrians, NCHRP Report 500, Volume 10, Transportation Research Board, 2004. A Guide for Reducing Collisions Involving Heavy Trucks, NCHRP Report 500, Volume 13, Transportation Research Board, 2004. A Guide for Addressing Head-On Collisions, NCHRP Report 500, Volume 4, Transportation Research Board, 2003. A Guide for Addressing Run-Off-Road Collisions, NCHRP Report 500, Volume 6, Transportation Research Board, 2003. Roadside Design Guide, AASHTO, 2002. Highway Capacity Manual, Transportation Research Board, 2000. Guide for the Development of Bicycle Facilities, AASHTO, 1999. Use of Shoulders and Narrow Lanes to Increase Freeway Capacity, NCHRP Report 369, Transportation Research Board, 1995. Roadway Widths for Low-Traffic Volume Roads, NCHRP Report 362, Transportation Research Board, 1994. Effective Utilization of Street Width on Urban Arterials, NCHRP Report 330, Transportation Research Board, 1990.